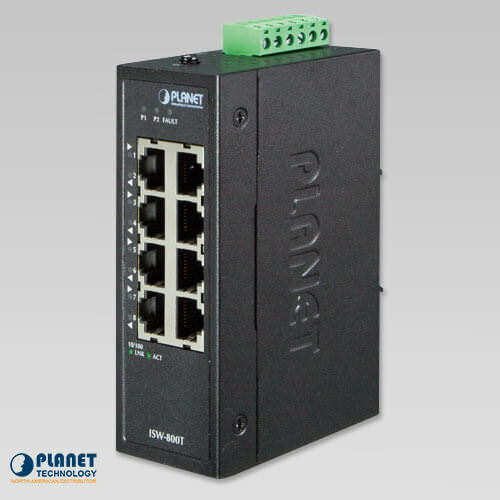 PLANET’s ISW-800T Industrial 8-Port 10/100TX Compact Ethernet Switch, suitable for industrial use, features 8 10/100Mbps auto-negotiation ports, IP30-rated rugged but compact case and a wide-ranging redundant power system (12~48V DC or 24V AC). 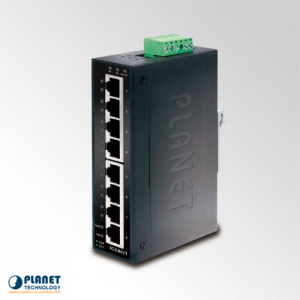 PLANET’s ISW-800T Industrial 8-Port 10/100TX compact Ethernet switch is suitable for industrial use, features 8 10/100Mbps auto-negotiation ports, IP30-rated compact case and a wide-ranging redundant power system (12~48V DC or 24V AC). The ISW-800T is able to operate in harsh environments with operating temperatures ranging from -40 to 75°C. With the rise of the IIoT (Industrial Internet of Things), the ISW-800T includes a ‘Plug and Play’ feature that is designed for easy industrial network deployment. It is also stable and reliable when it comes to a fast data and power transmission. The ISW-800T provides link-on cable length power saving and link-down power saving methods. These features allow the ISW-800T to consume very low amounts of power in full loading operation mode, which helps conserve energy and maintains high performance. With ‘Auto Power Saving’ and IEEE 802.3az Energy Efficient Ethernet (EEE) Protocol, the ISW-800T can automatically detect cable link status and network traffic, and thus is able to adjust power consumption accordingly. It enables the switch to consume less power when it’s less active. The ISW-800T features a strong dual power input system with a wide-ranging voltage (12V~48V DC or 24V AC) that is incorporated into a customer’s automation network to enhance system reliability and uptime. The ISW-800T provides contact discharge of ±6KV DC and air discharge of ±8KV DC for Ethernet ESD protection. It also supports ±4KV surge immunity to improve product stability and protects users’ networks from devastating ESD attacks, making sure the flow of operation does not fluctuate. The ISW-800T offers a high-performance switch architecture. With the 8 10/100Mbps Fast Ethernet ports providing non-blocking switch fabric and wire-speed throughput as high as 1.6Gbps and a 1K MAC address table, the ISW-800T can perform wire-speed packets transfer without the risk of packet loss. The flow control function enables the ISW-800T to provide fast and reliable data transfer. All of the RJ45 copper interfaces in the ISW-800T support 10/100Mbps auto-negotiation for optimal speed detection through RJ45 Category 6, 5 or 5e cables. The standard auto-MDI/MDI-X support can detect the type of connection to any Ethernet device without requiring special straight-through or crossover cables. 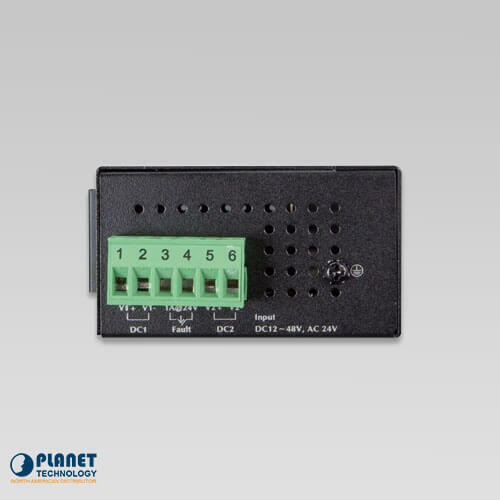 The IGS-1020TF by PLANET Technology provides 8-port 10/100/1000BASE-T RJ45 copper and 2 extra 100/1000BASE-X SFP fiber optic interfaces delivered in an IP30 rugged strong case with redundant power system. 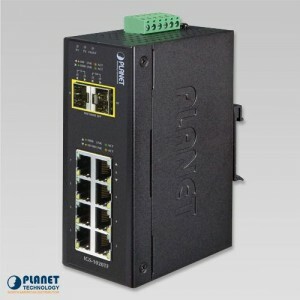 Planetechusa.com is proud to release a quality fast ethernet switch that includes a high quality IP-30 slim case. 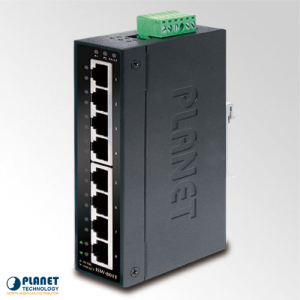 Planetech USA’s IGS-801T is an IP30 Industrial Gigabit Ethernet Switch with 8 10/100/1000TX ports that supports -40~75°C operating temperatures. 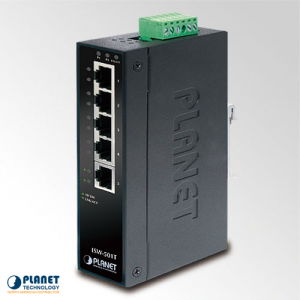 The IGS-501T from Planet Technology is a 5-port industrial gigabit ethernet switch that is DIN or wall mountable. 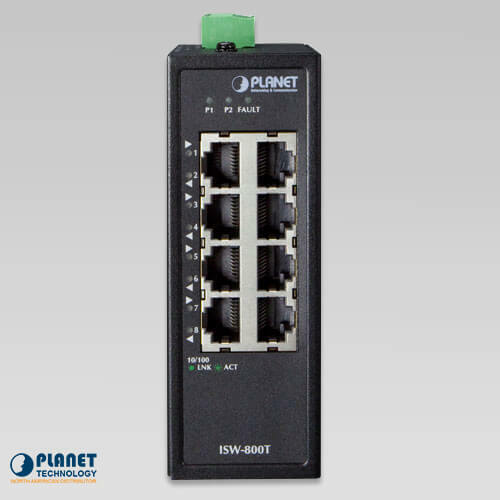 The ISW-501T fast Ethernet switch from Planet Technology is a durable unit that showcases resistance and stability.